Earlier today, Apple launched updated MacBook Pro models, moving its 15" and 17" models to Intel Core i5 and i7 processors utilizing integrated Intel graphics paired with NVIDIA GeForce GT 330M discrete graphics cards. The new 13" MacBook Pro, however, continues to utilize Intel Core 2 Duo processors with a custom NVIDIA GeForce 320 integrated graphics solution. Some observers have questioned why Apple did not make a more substantial upgrade to the processors used in the 13" models. One interested party even went so far as to send an email to Apple CEO Steve Jobs about the decision, and shared Jobs' response with us. According to Jobs, Apple chose to focus on the graphics performance and combine it with outstanding battery life instead of opting for the alternative of merely a small increase in CPU speed. We chose killer graphics plus 10 hour battery life over a very small CPU speed increase. 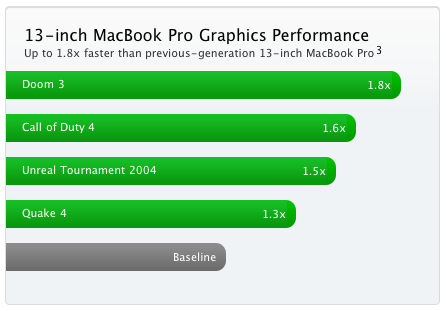 Users will see far more performance boost from the speedy graphics. Early benchmarks show significantly improved performance for the Core i7-based MacBook Pro, and it will be interesting to see how the new 13" models compare to their predecessors in various tasks.